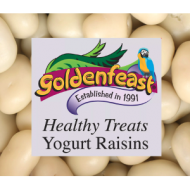 For that special bird in your life, our goldenfeast Healthy Treats Yogurt Raisins are the perfect blend of healthy and treat. Coated on the outside with protein and probiotic rich yogurt, when yoru bird beaks through the candy like, bird safe outside, they will find a delicious raisin on the inside. Has your Macaw or Amazon been a good birdy today? Givem them a delicious, yogurt drop to show them how lucky you are to have them. 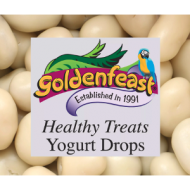 Not only are the goldenfeast healthy treats yogurt drops a delicious treat for your medium to larger size bird, they come packed with protein and probiotics. 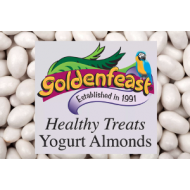 For that special good birdy in your life, our Goldenfeast Healthy Treats Yogurt Almonds are the perfect blend of healthy and treat. 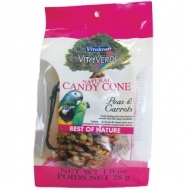 Coated on the outside with protein and probiotic rich yogurt, when your bird beaks through the candy like, bird safe coating, they will find a delicious and nutritious Almond on the inside. 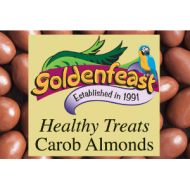 Another great Goldenfeast Healthy Treat, our Carob Almonds, will have your Caique doing blackflips and your Macaw on the best behavior you have seen in years, jsut to get one of these treats. We take the highest quality almonds and coat them with an amazingly nutritious bird safe version of chocolate, carob! Egg food adds variety and important digestible protein to a bird's diet that pelleted or seed diets can't offer alone. 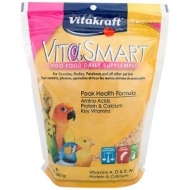 VitaSmart® Egg Food Daily Supplement is enriched with important vitamins, amino acids, and calcium to keep your companion in peak health. Egg is a great supplementary food for birds, particularly during times of stress such as a new environment or moulting. It also works well for serving vet-prescribed vitamins and medications during times of illness. A wholesome pine cone treat for hookbills, filled with delicious peas, carrots, and beans. 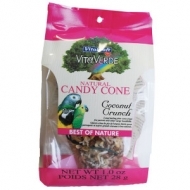 VitaVerde Natural Candy Cones provide birds with hours of natural and nutritious foraging fun. Ingredients are baked deep into the cracks and crevices of a real pine cone, providing a challenge and a healthy means for birds to satisfy their natural foraging instincts and simulating preening. A wholesome pine cone treat for hookbills, filled with tropical coconut, peanuts, and sweet potato pieces. 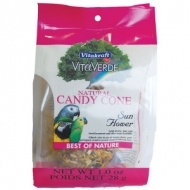 VitaVerde Natural Candy Cones provide birds with hours of natural and nutritious foraging fun. Ingredients are baked deep into the cracks and crevices of a real pine cone, providing a challenge and a healthy means for birds to satisfy their natural foraging instincts and simulating preening. Vitamin fortified crunchy treat sticks made with millet, oranges, carrots, and honey for a tasty, healthy reward. Triple Baked Crunch Sticks are more than just a treat: they help promote important chewing needed for wearing down a bird's beak to keep it healthy and strong. 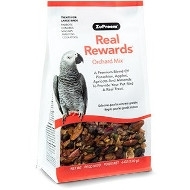 Treats can also help keep birds mentally and physically stimulated to prevent boredom and stress that may lead to feather plucking. 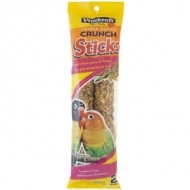 Crunchy treat sticks made with seeds, millet, honey, and vitamins that are great for birds during moulting. 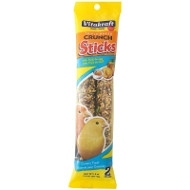 Triple Baked Crunch Sticks are a tasty, healthy reward that promotes important chewing needed for wearing down a bird's beak to keep it healthy and strong. They also help keep birds stimulated to prevent boredom and stress that can lead to feather plucking. 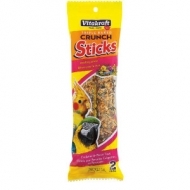 Vitamin fortified crunchy treat sticks made with millet, seeds, fruit, and honey for a tasty, healthy reward. Triple Baked Crunch Sticks are more than just a treat: they help promote important chewing needed for wearing down a bird's beak to keep it healthy and strong. Treats can also help keep birds mentally and physically stimulated to prevent boredom and stress that may lead to feather plucking. Vitamin fortified crunchy treat sticks made with millet, seeds, and a touch of honey for a tasty, healthy reward. Triple Baked Crunch Sticks are more than just a treat: they help promote important chewing needed for wearing down a bird's beak to keep it healthy and strong. Treats can also help keep birds mentally and physically stimulated to prevent boredom and stress that may lead to feather plucking. 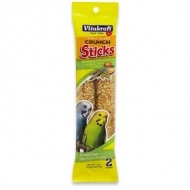 Vitamin fortified crunchy treat sticks made with millet, seeds, and safflower for a tasty, healthy reward. Triple Baked Crunch Sticks are more than just a treat: they help promote important chewing needed for wearing down a bird's beak to keep it healthy and strong. Treats can also help keep birds mentally and physically stimulated to prevent boredom and stress that may lead to feather plucking. 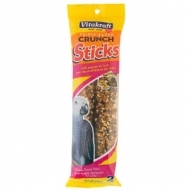 Vitamin fortified crunchy treat sticks made with sunflower seeds, grains, and vegetables for a tasty, healthy reward. Triple Baked Crunch Sticks are more than just a treat: they help promote important chewing needed for wearing down a bird's beak to keep it healthy and strong. Treats can also help keep birds mentally and physically stimulated to prevent boredom and stress that may lead to feather plucking. 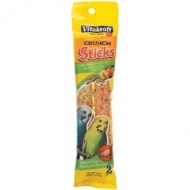 Vitamin fortified crunchy treat sticks made with grains, seeds, and fruit for a tasty, healthy reward. Triple Baked Crunch Sticks are more than just a treat: they help promote important chewing needed for wearing down a bird's beak to keep it healthy and strong. Treats can also help keep birds mentally and physically stimulated to prevent boredom and stress that may lead to feather plucking. 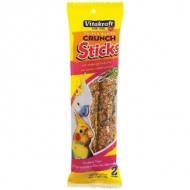 Vitamin fortified crunchy treat sticks made with seeds, plum, and apricot for a tasty, healthy reward. Triple Baked Crunch Sticks are more than just a treat: they help promote important chewing needed for wearing down a bird's beak to keep it healthy and strong. Treats can also help keep birds mentally and physically stimulated to prevent boredom and stress that may lead to feather plucking. Vitamin fortified crunchy treat sticks made with grain, seeds, and fruit for a tasty, healthy reward. Triple Baked Crunch Sticks are more than just a treat: they help promote important chewing needed for wearing down a bird's beak to keep it healthy and strong. Treats can also help keep birds mentally and physically stimulated to prevent boredom and stress that may lead to feather plucking. 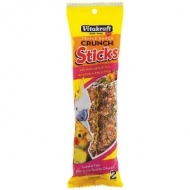 Vitamin fortified crunchy treat sticks made with nut, seeds, fruit, and a touch of honey for a tasty, healthy reward. Triple Baked Crunch Sticks are more than just a treat: they help promote important chewing needed for wearing down a bird's beak to keep it healthy and strong. Treats can also help keep birds mentally and physically stimulated to prevent boredom and stress that may lead to feather plucking. 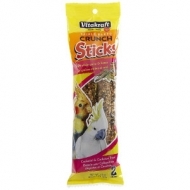 Vitamin fortified crunchy treat sticks made with millet, fruit, and egg for a tasty, healthy reward. Triple Baked Crunch Sticks are more than just a treat: they help promote important chewing needed for wearing down a bird's beak to keep it healthy and strong. Treats can also help keep birds mentally and physically stimulated to prevent boredom and stress that may lead to feather plucking. Vitamin fortified crunchy treat sticks made with millet, egg, and a touch of honey for a tasty, healthy reward. Triple Baked Crunch Sticks are more than just a treat: they help promote important chewing needed for wearing down a bird's beak to keep it healthy and strong. Treats can also help keep birds mentally and physically stimulated to prevent boredom and stress that may lead to feather plucking. Vitamin fortified crunchy treat sticks made with seeds, egg, veggies, and a touch of honey for a tasty, healthy reward. 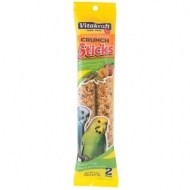 Triple Baked Crunch Sticks are more than just a treat: they help promote important chewing needed for wearing down a bird's beak to keep it healthy and strong. Treats can also help keep birds mentally and physically stimulated to prevent boredom and stress that may lead to feather plucking. 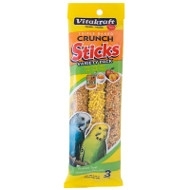 Three delicious flavors of our vitamin fortified crunchy treat sticks for parakeets: honey, egg, and fruit. Made with a variety of wholesome ingredients, Triple Baked Crunch Sticks are a tasty, healthy reward for your companion. Treats can also help keep birds mentally and physically stimulated to prevent boredom and stress that may lead to feather plucking. Nutritious and fun corn cob treat that can be offered as is, or popped in the microwave into tasty popcorn. 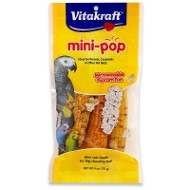 Mini-Pop is a favorite foraging treat for many bird companions. Serve it unpopped right out of the bag, or toss it in the microwave first to transform it into a tasty popped corn treat.